Deforestation and forest degradation can happen quickly, such as when a forest is clear-cut to make way for a palm oil plantation or a new settlement. It can also happen gradually as a result of ongoing forest degradation as temperatures rise due to climate change caused by human activity. 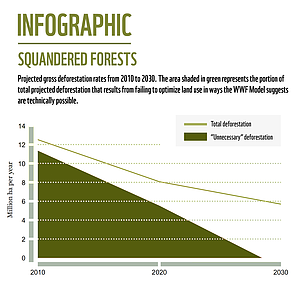 The most common pressures causing deforestation and severe forest degradation are agriculture, unsustainable forest management, mining, infrastructure projects and increased fire incidence and intensity. Some infrastructure activities, such as road building, have a large indirect effect through opening up forests to settlers and agriculture. 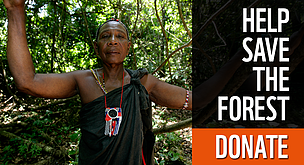 Poor forest management and unsustainable fuelwood collection degrade forests and often instigate a "death by a thousand cuts" form of deforestation. Conversion of forests for other land uses, including pulp, palm, and soy plantations, pastures, settlements, roads and infrastructure. Forest fires: Each year, fires burn millions of hectares of forest worldwide. Fires are a part of nature but degraded forests are particularly vulnerable. These include heavily logged rainforests, forests on peat soils, or where forest fires have been suppressed for years allowing unnatural accumulation of vegetation that makes the fire burn more intensely. The resulting loss has wide-reaching consequences on biodiversity, climate, and the economy. Illegal and unsustainable logging: Illegal logging occurs in all types of forests across all continents – from Brazil to Indonesia – destroying nature and wildlife, taking away community livelihoods and distorting trade. Illegally harvested wood finds its way into major consumption markets, such as the U.S., and European Union, which further fuels the cycle. Fuelwood harvesting: Over-harvesting for domestic use or for commercial trade in charcoal significantly damages forests. Mining: The impact of mining on tropical forests is growing due to rising demand and high mineral prices. Mining projects are often accompanied by major infrastructure construction, such as roads, railway lines and power stations, putting further pressure on forests and freshwater ecosystems. Climate change: Forest loss is both a cause and an effect of our changing climate. Climate change can damage forests, for instance by drying out tropical rainforests and increasing fire damage in boreal forests. Inside forests, climate change is already harming biodiversity, a threat that is likely to increase.